AMES Group represents a unique combination of aviation competences. AMES was founded as a fully specialized aviation engineering company in 2004. Ranging from the design, the development and production of customized aircraft cabin parts, from certification of Minor Changes to Supplemental Type certificates, from aircraft evaluations to continued airworthiness management. The AMES Group is known as a true one stop shop for a variety of aviation customers - from the idea to the finished product in the aircraft. AMES Aerospace and Mechanical Engineering Services GesmbH AMES has been certified according to EN/AS 9100 since 2004 and EASA Part 21J DOA (Approval Reference EASA. 21J.299) since 2006. The EASA approved AMES Design Organisation provides various engineering services including certification, stress analysis, damage tolerance analysis and development of mechanical components and aircraft interiors. The AMES DOA provides services achieving the highest industry standards based on the experience gained through more than 600 successfully completed EASA certification projects. AMES CAMO is an EASA Part M approved CAMO organisation and AMES became the first Austrian EASA Part M approved CAMO in 2008 (Approval Reference AT.MG.510). Recommendations have been issued to, and accepted by most European Civil Aviation Authorities. AMES Production and Logistic Services GmbH In 2009 AMES set up a production Organization which has been EASA Part 21G certified since June 2009. (Approval Reference AT.21G.0015). AMES Production and Logistic Services GmbH provides a wide range of interior and mechanical components. Integrated in an EASA Part 21 J environment, AMES PLS can guarantee shortest lead times, the highest grade of flexibility and customization available on today's market. All customized cabin interior, avionics and structural parts will be fully customized and delivered in the shortest lead time released with EASA Form 1 and ready for installation. AMES CaT provide specialized consultancy and training services, using the broad experience the AMES Group has gained in more than 1000 successfully completed Design, Production and CAMO projects. 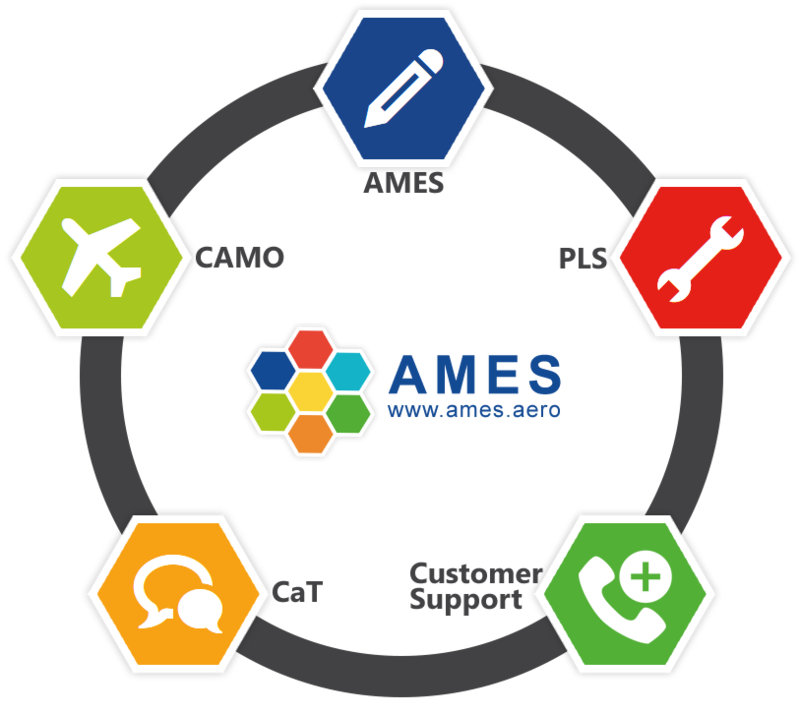 AMES Cat is providing its services using the expertise gained in the different fields of the AMES Group as well as external experts from different Aviation Authorities and institutions. AMES Ireland Ltd. support our Irish Customers with CAMO, Design and Production Services. AMES Ireland offices are located at Hangar 5, Dublin Airport and we Support our Irish customers with a growing team of local aviation experts.